The Old Testament has often been taken out of textual and historical context by our secular culture,at times by the church as a whole and by our own personal opinions based on our experiences in the world and in the church. It is clear that we need to know the real God of the Bible, not a fabricated image we conjure based on false information and opinion. From beginning to end, the Bible is God’s story of His faithfulness, promise and provision to a wayward and unfaithful people. We need to get to know this story - His story. In knowing who God is as He is revealed in the pages of scripture, we can then reflect His character in our lives to the world around us. Why was the Exodus of the Israelites such an important event? What should be our response to God’s provision in our own lives? SGAC HOUSE OF PRAYER this Sunday, November 18 at 6:00 pm. Join us for a night of unbroken modern worship, praise and prayer. Come and spend time in an atmosphere of scripture-based worship and prayer over our church and community. CHILDREN’S CHRISTMAS REHEARSALS ALL Grade 1-6 students are invited to attend our Saturday morning rehearsals. Nov. 24, Dec. 1 and Dec. 8 from 9:30 am to 11:30 am. YOUTH: MISSING PERSONS November 23 we are going to the West Edmonton Mall to find our leaders. The bus leaves at 7:00 pm SHARP!! Cost is $2 which helps cover the costs of the bus. You and your friends MUST have your youth information form in order to come and to ride the bus. Forms can be filled out here. YOUNG ADULTS worship night Saturday November 24 at 6:00 pm here in the Oasis room. All Young Adults are invited to join us for a night of worship. Please invite any other Young Adults you know. Afterwards, we will hangout for games and snacks. SINGIN' THE GOSPEL Join us on Sunday, November 25 at 6:00 pm The FRASER VALLEY QUARTET. A freewill offering will be taken. BLESS THE PASTORS AT CHRISTMAS Choose a gift card tag from the The Blessing Tree. Purchase your choice and return the gift card and tag to the Box at the Welcome Centre. The last Sunday to select a tag will be Dec. 9. SGAC’s CHRISTMAS BANQUET and the “Retelling of the Christmas Carol”. Friday, December 7 at 6:00 pm. Cost is $25/ person. Tickets are available at the Welcome Centre after a Sunday service or by calling /visiting the church office. 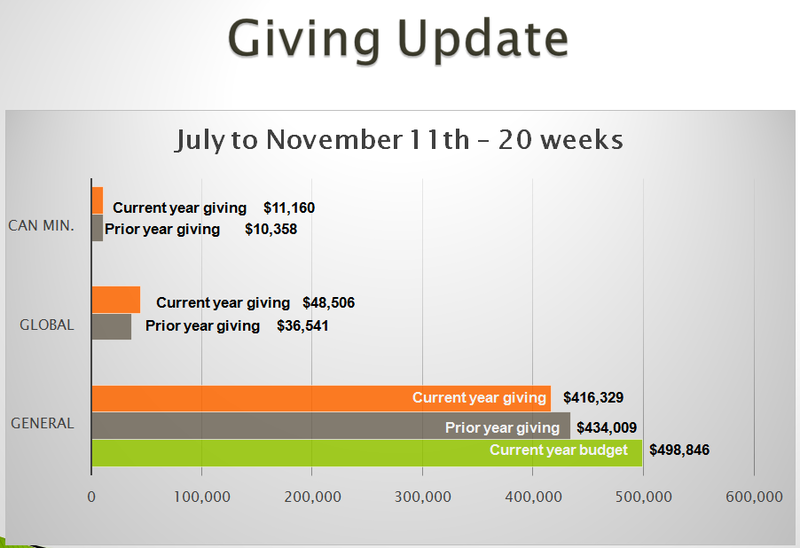 The General Fund is in need of your help, giving for the current fiscal year July 1 to November 11th has been averaging $20,829 compared to our budget requirement of $24,942. This has resulted in an overall budget shortfall of $82,500 for the current year. As we look to the upcoming year, our budget includes the addition of a pastoral staff member. If we are to proceed, this needs our immediate attention. Please pray about this important matter and give as you are able. God bless you as you commit a portion of your resources to His work in reaching our community for Him. Our International Workers: Matthew & Charity Quick, Shaun & Iris Kelly, Charles & Angela Ibsen. Our Pastoral Team Staff Member: Pastor Scott Buck. Pastor Scott is married to Lyn and they have 7 children, ages 11, 9, 8, 6, 3, 2, and 4 months. Our Administrative Team Staff Member: Corina Langdon. Corina is married to Boyde and they have 3 children 21, 19 and 17. Our Elders Team Member: Anthony Toornstra. Anthony is married to Rosie and they have 4 children ages 8, 7, 3 and 5 months. WE REJOICE with the following people who have chosen to be baptized this weekend: Lane Seely, Aiden Turton and Tony Sera. Thank you for participating in the Operation Christmas Child Shoebox program. We collected 396 shoeboxes that have been shipped to Samaritan’s Purse in Calgary for distribution around the world. Our Deepest Sympathies to Kenton and Laurie Breitkreuz in the passing of Laurie’s dad. HMI Chili cook off fundraiser. Hockey Ministries International presents a chili cook off featuring the Spruce Grove Saints. Come support Tim Wiebe and his work with HMI to see which Saints’ players or coaches can make the best pot of chili. Sunday Nov 18 in the lounge at the Grant Fuhr Arena. Doors open at 5:30 chili served at 6. There is no charge to attend, donations will be accepted at the door. Please register by email .